Launched almost two years back 2014, Hyundai Xcent the compact sedan from Korean car maker has been an average performing vehicle by company in Indian car market. According to fresh reports the Indian arm of Hyundai is now going to bring the first facelift version of Xcent sometimes during the month of March 2017. Although, the car did not succeed in impressing to huge segment of buyers in Indian car market but has emerged as the highly preferred vehicle by taxi operators like Uber and Ola. In the facelift avatar Xcent is expected to carry vast cosmetic updates on exteriors which will be helpful in removing the drawbacks which were realized by car enthusiasts in its first generation. It is believed that the refreshed version of Xcent will succeed in impressing the new buyers. As far as engine configuration is concerned it is reported to continue the existing engine configuration of 1.2 litre petrol and 1.1 litre diesel engine. The refreshed Hyundai Xcent will compete against Chevrolet Beat Essentia and Tata Kite 5, which are also expected to make their debut in 2017. On exterior, the front fascia is reported to carry refreshed bonnet carrying resemblance of European version Grand i10, which means the generation next Xcent will embellish hexagonal front grille, new front bumper along with newly developed head and fog lamps. 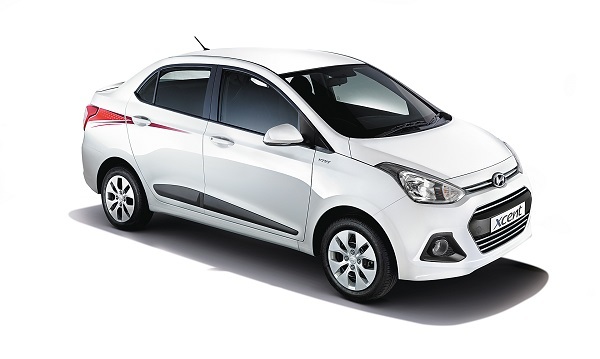 It is said that the front fascia of Xcent will also be offered in the facelift version of its sibling Grand i10, which is scheduled for launch during the month of January next year. Moving towards the rear portion, according to sources of company the facelift Xcent will receive candid changes which will help in making it look bigger than its erstwhile version. Along with thi the rear portion will also receive refreshed enlarged tail lamps. Inside the cabin you will find new touchscreen infotainment system with audio-video navigation.